Based on a remarkable true story, director Stephen Frears has crafted a heart-warming, bittersweet film of keeping secrets, the emotional toll they take, and finally letting go of past regrets. Philomena Lee (Judi Dench) was forced to live in a convent as a teenager by her unloving father in 1950s Ireland. Being a naive, rebellious girl, she inadvertently gets pregnant after she falls for a boy she meets at a fair. The nuns force her to give the child up for adoption without telling her where he was going, and has spent the past 50 years of her life searching for answers, trying to find him, and wondering what happened to him. Martin Sixsmith (Steve Coogan) is a troubled journalist, out of a job after mistaken bad publicity, and looking for his next piece of work. A chance encounter at a party brings him together with Philomena, her daughter, and this story. He is initially reluctant to take it on, as Human Interest stories are not to his liking, but his publisher forces his hand. As they begin digging, they return to the convent to find answers but in return come up empty handed. A drunken conversation with a bar tender in the area reveals to Martin that it used to be wealthy Americans coming to the convent to buy the babies. This leads the two of them to America, as several clues lead to a cascading trail of answers. Sixsmith calls in several favours from past Washington D.C. journalist contacts. However, the answer they find is not the resolution Philomena wanted and she begins to question the whole exercise and tells Martin she doesn’t want the story published. His publisher coerces him to convince Philomena to stay in America and continue the story. Upon following the trail, she learns about her son and who he became. She begins to find the answers she wanted and the closure she needed. The end of the road has taken them full circle back to the convent where they find the nuns covering up the details of the adoption so that mother and child could never be reunited. This is their penance for their sins, but ultimately the mystery is resolved after a confrontation by Sixsmith with the nuns. Judi Dench gives a stoic and brave performance of a woman who has lived a life of regret and secrets. Once Philomena finally lets her guard down and reveals what she has kept hidden, she is filled with many emotions and is finally beginning to deal with the trauma. Dench, together with Steve Coogan, will charm their way into the audience’s heart. The two of them have great chemistry together on screen and they play well off each other. They are actors at the top of their game; they are masters of the craft. The film is surprisingly humourous, which is needed as a relief from the heartbreak of the journey. 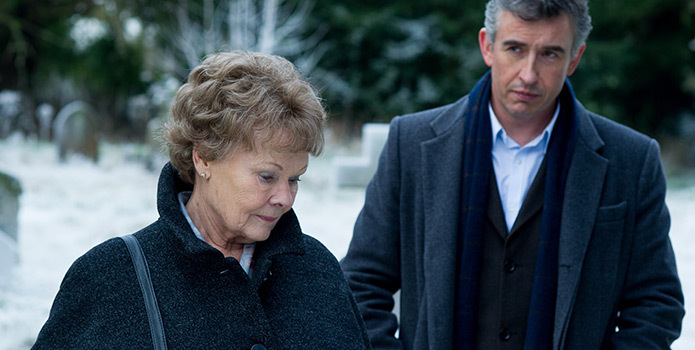 Dench’s Philomena is a biting, blunt, and curious woman. She has been through too much, for far too long, and has come too far to not continue and takes every new experience in stride. She is a polite and kind woman but also never filters her intentions. This just adds to her charm. This is a strong, well-written film that allows the actors to just play, draw out the characters and give excellent performances. It is the perfect antidote to an overbearing Hollywood blockbuster. It is a smart and intelligent film that solidifies Judi Dench as one of our most cherished and beloved actresses.